Highway Records look to the release of the debut album from one of Russia’s most talented and talked about producers, Andrey Kadomtsev AKA BarBQ. The Highway Records imprint has been one of the most interesting record labels to come out of Russia in the last few years, mixing up releases from local talented artists with remixes from some of the world’s leading electronic producers. Along the way the label has collaborated with the likes of Gui Boratto, Hernan Cattaneo, Phonique, Gorge, Ian Pooley, Martin Dawson, Terry Lee Brown Junior, Dirt Crew, Sasse, Robert Babicz and Alex Niggemann. 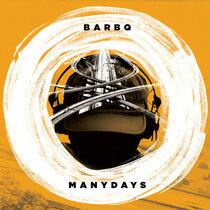 Now, two years after its inception, Highway Records is looking to the release of its first long player, to be provided by the highly talented Russian producer Andrey Kadomtsev AKA BarBQ. Kadomtsev cut his musical teeth in the record shops and nightclubs of his native St Petersburg, but it wasn’t long before his musical abilities were being picked up on around the world. Early releases on a local St Petersburg label led to Mr C signing a BarBQ release for his Superfreq label and soon Kadomtsev was recording for the likes of Ben Watt’s Buzzin Fly and Sebastian Davidson’s Nightbird Music. Now Andre Kadomtsev has decided to distil his musical experiences to date with the release of his debut BarBQ album ‘Many Days’. The album is a collection of 14 tracks that flow effortlessly between floorfilling house music and emotive electronica. From the opening broken beat opus of ‘To All the Loved Ones’ through the laidback, breakbeat based strains of ‘Maria’ through to the ambient and heartfelt closing number ‘Rita & Guitar’ there is a rich vein of beautiful and melancholic music here. That leftfield side to the LP perfectly marries up with the more uptempo tracks such as ‘Holding Your Breath’, ‘Outbreaks Of The City At Night’ and ‘Inability To Speak’ as Kadomtsev’s production skills bring a style and feel that flows through the whole album. ‘Many Days’ will appeal to fans of club music and will be as comfortable on a home stereo as a club sound system and may appeal to music lovers everywhere. It’s out 9th July.